CERT stands for Community Emergency Response Team. CERT is a joint effort between the Escondido Fire Department and you, a member of the community, to become better prepared for emergencies. CERT program instructors from the Escondido Fire Department provide emergency preparedness and response training. Graduates of the CERT program also have an opportunity to become disaster volunteers with the city and make a difference! Disasters happen, and when they do it can take 72 hours for emergency services to help those who have been affected. Preparing in advance and knowing what to do to keep yourself, your family, and your neighborhood safe can mean the difference between being a victim and being able to help. CERT training can help you make a difference. What does CERT training cover? Prepare yourself and your family for natural disasters and acts of terrorism. Perform simple search and rescue operations. When is CERT training held? 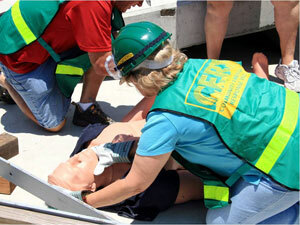 CERT Training Academy is usually held late February and early March. How can I find out more about CERT?